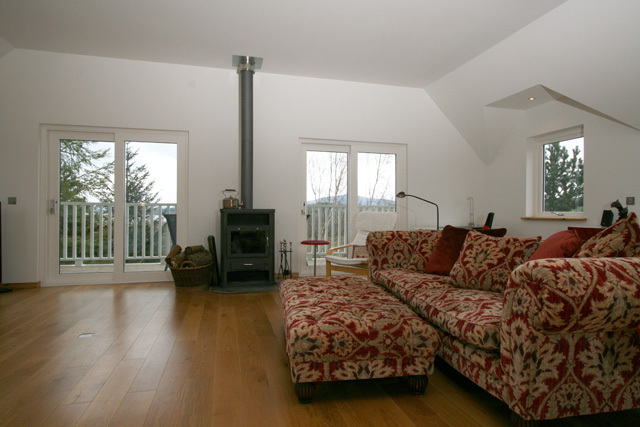 Fhaireag is situated in the small hamlet of Wester Aberchalder on the quiet and unspoilt south side of Loch Ness. 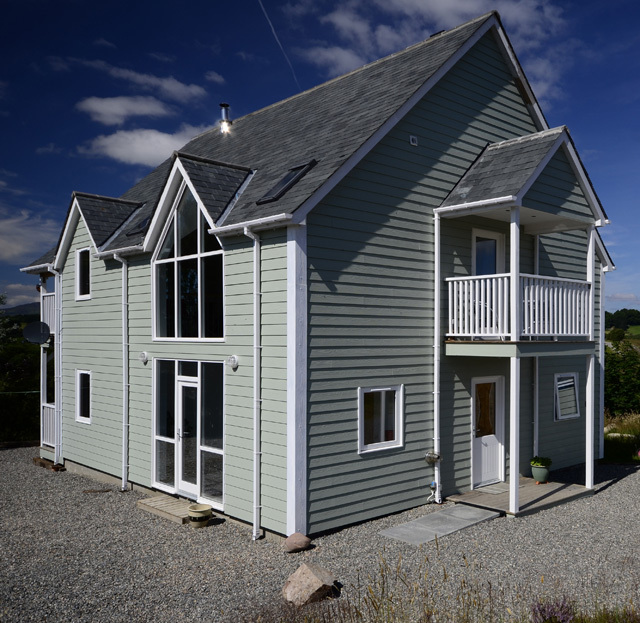 This newly completed property is architecturally striking, and is somewhat different from the more traditional holiday cottage that is often found in the area. 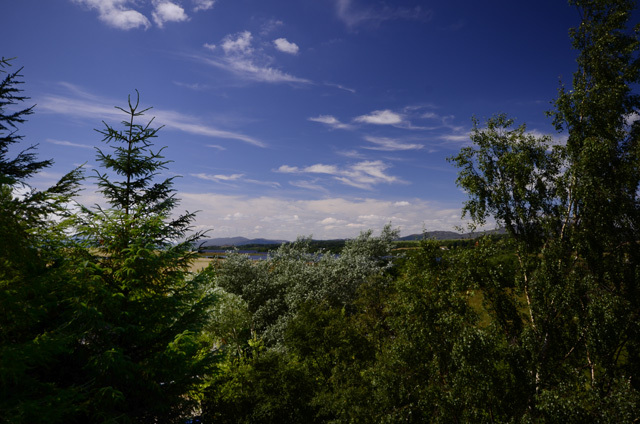 The property enjoys uninterrupted views to Loch Mhor and to the Monadhliath mountains, and offers walks direct from to the doorstep into the surroundings hills. The location of the property makes it an ideal base for exploring. Inside the property is spacious, modern and light, the house has been reversed in order with the living areas on the first floor, and on the ground the bedrooms. 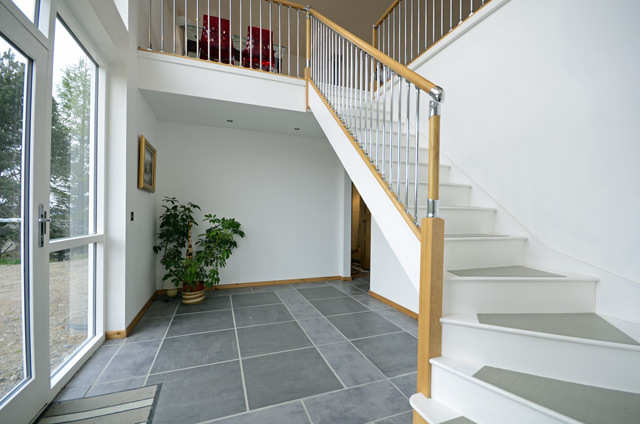 Throughout the beautiful wooden and tiled floors benefit from under floor heating. When entering through the full height hall, guests will get an inkling of what the interior might be like, upstairs leads to the beautiful open plan lounge, dining and kitchen area. 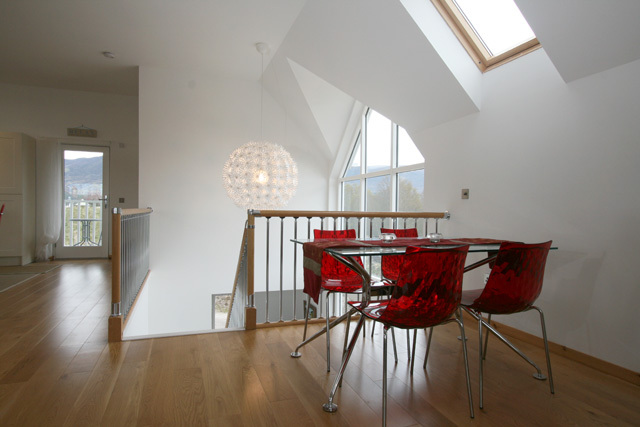 Furnished with an eclectic mix of modern and more traditional pieces, the lounge and dining room offers direct access through patio doors to a decked balcony area with seating, looking across to Loch Mhor. The kitchen benefits from an island unit with seating, ideal for relaxing at and watching the cook at work. 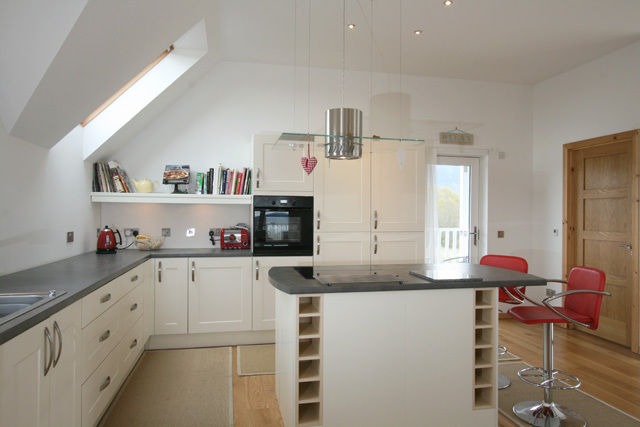 The kitchen is well equipped with all the usual kitchen equipment and offers amble storage and preparation areas. Off the kitchen a door leads to a small balcony area at the back of the property, ideal for the morning sun. A small cloakroom completes the facilities on this level. 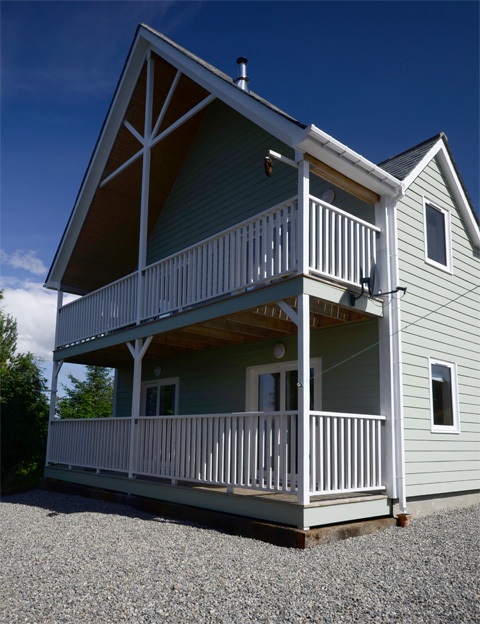 On the lower level the bedrooms are located at the front of the property and have direct access to the decked balcony area. Both bedrooms are furnished with modern furniture and the master has an en-suite bathroom complete with a corner bath and a separate shower. Completing this level the large utility room offers adequate storage for boots and coats, and off this a further cloakroom with a large shower. Fort Augustus the largest population centre in the area is fourteen miles away, it is has a small selection of shops together with a few restaurants. The village is at the southern end of the renowned Loch Ness and it is here that the loch joins the Caledonian Canal. The canal runs from Inverness in the North East to Corpach near Fort William in the South West, built to the design of Thomas Telford in the early 1800s. Once complete it avoided the necessity of ships travelling around the north of Scotland and through the notorious Pentland Firth. The busy lock system at the heart of the village is an ideal place to sit and relax and watch the many boats passing through. For experienced walkers Ben Nevis and for mountain bikers and skiers the Nevis Range at Aonach Mor are within an hours drive. Even in the summer months the skiing area is well worth a visit, the gondola trip to the top of the mountain offers the chance to enjoy some spectacular scenery, and the Mountain Discovery Centre, gift shop and restaurant are ideal places to pass some time. The area is also very popular with mountain bikers and hosts a wide range of events throughout the summer months. Ben Nevis is the highest of all the mountains in the British Isles at 4409ft, it is an extremely popular and attracts many thousands of people every year. Further afield there a host of places to visit, the Isle of Skye and the west coast are within a ninety minute drive, on the journey you will pass Eilean Donan Castle near Dornie, one of the most famous of Scotland’s Castles and certainly the most photographed. Your final destination on the west coast will be Kyle of Lochalsh, close by you can either take the bridge across to Skye and visit such places as Dunvegan Castle or Talisker Distillery, or spend your time enjoying the magnificent scenery including the Cullin mountains. Alternatively stay on the mainland and explore the area north around Plockton, Loch Carron and Applecross. Closer to home the area around Loch Ness is extremely popular, the southern shores tend to be quieter, and the road network is ideal for any biking or walking enthusiast. The small villages on the shoreline include Foyers, Inverfairigaig, and Dores, home to the well known Rockness festival in June, the Dores Pub, and one of the best beaches in the area. The southern side is also home to the South Loch Ness Trail, this 28 mile route is suitable for walkers and mountain bikers, and offers the chance of viewing some of the best scenery and views in the area..
For more information on things to do in the area, please see the owners Facebook page. 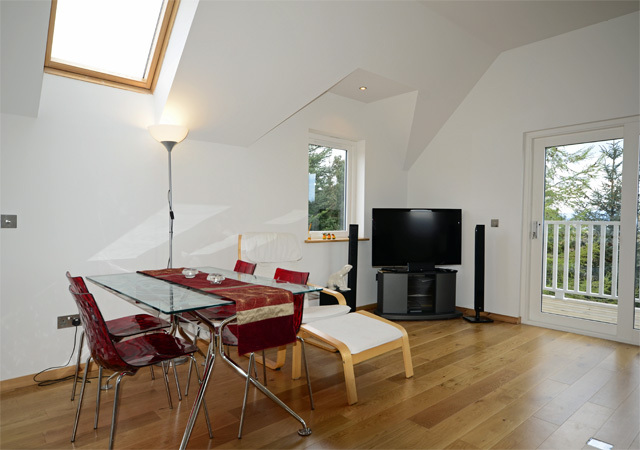 Large open plan Lounge/kitchen/dining area, direct access to balcony areas at front and rear of the property. 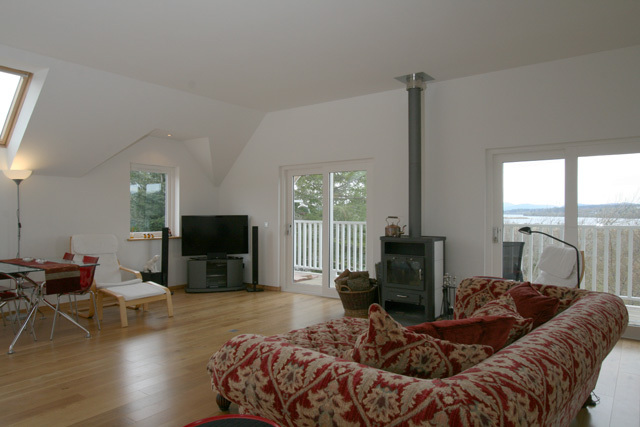 Lounge, comfortable sofa, armchairs, wood burner, large TV with freesat channels, Blu Ray DVD/CD, iPod dock, dining area with table and seating for four. Fitted kitchen, island unit with seating, induction hob, oven and grill, microwave, fridge, freezer, dishwasher, and all the usual kitchen equipment. Master bedroom with access to decked balcony, king size bed, en-suite bathroom, corner bath, seperate shower, wc, whb, heated towel rail. 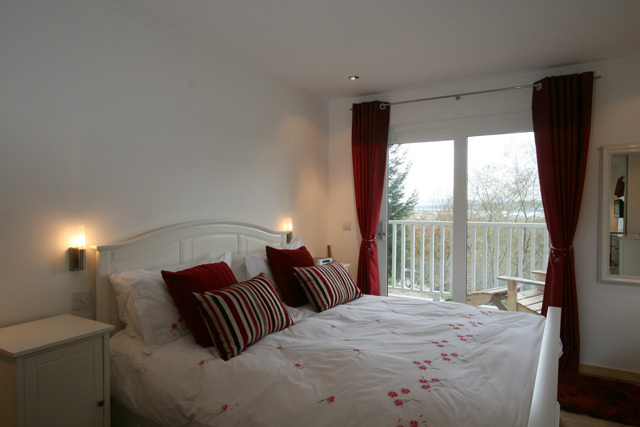 Twin bedroom, with direct access to decked balcony. Utility room with washing machine, tumble dryer, amble storage for boots etc. Shower room with large shower, wc, whb. Electricity and oil under floor heating. Two pets are accepted at the property, and the garden is enclosed. A Good Housekeeping Deposit of £75.00 is require at the property. Contemporary property not often available. 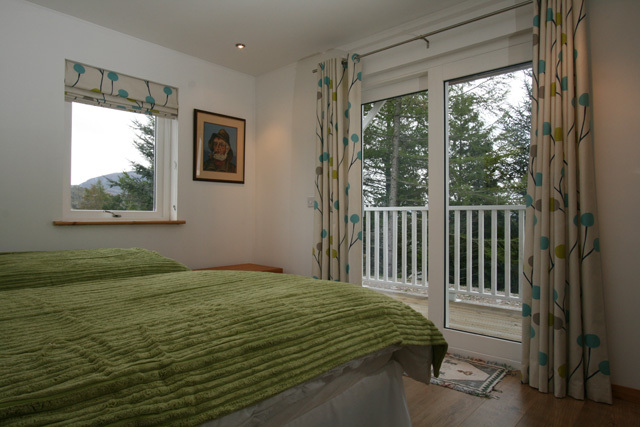 Perfectly situated with direct access to the hills from the front door. The quiet and unspoilt south side of Loch Ness is ideal for cycling and walking. Fhaireag is a wonderful holiday home. The location is utterly scenic and this time we experienced every type of weather imaginable making the views from the balconies even more impressive. Wildlife and birdsong abound. It is well equipped, tastefully furnished and warm. This is the 3rd visit to this wonderful cottage and it gets better every time. This place is in a fantastic peaceful setting with deer in the garden next door. 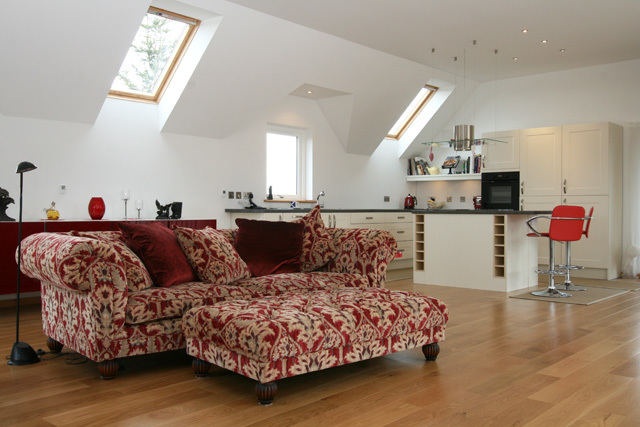 There are wonderful views from every window and the house benefits from having the lounge upstairs to appreciate the scenic surroundings. There are great walks straight from the door or just a short drive away. The place is equipped with every thing you need for your stay and is very comfortable . Wonderful property. Second year in a row and it just continues to impress. Peaceful and scenic and very dog friendly. Great location to travel round the north of Scotland and take in the odd golf course and distillery as well. Just back from another fantastic week in this cottage. Excellent facilities and maintained to a very high standard. We saw lots of wildlife, deer in the garden, hare's running down the lane. We even saw Osprey this year on Loch Inch. We had the added bonus of great weather (20 degrees and sunny one day). We will be back next year. Fantastic house you will not be disappointed. Views stunning, quiet relaxing amazing location. The house has everything that you will need for a great holiday all you will need is your food. There are even cook books in the well stocked kitchen. Would definitely recommend. Five star !! !